Product #20589 | SKU 3I-5014-OP | 0.0 (no ratings yet) Thanks for your rating! The iSeries Waterproof Open Cavity Flight Case for Bass Guitar from SKB is designed to accommodate a large variety of bass guitars. The case's interior is plush lined and injection moulded for neck and body support. 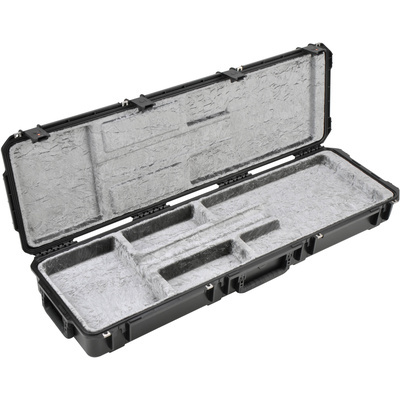 Constructed of polypropylene copolymer resin, the case's exterior features a gasketed, waterproof, submersible design that is resistant to corrosion and impact damage. The stainless-steel moulded-in hinge trigger release latch system is recognised and accepted by the TSA, and also has 4 reinforced locking loops for your own supplied locks. The snap-down rubber over-moulded grip handle and quiet-glide wheels are designed for easy transport.